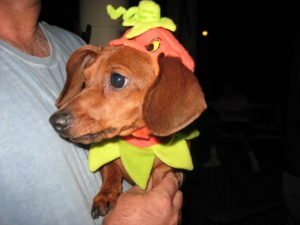 Oh, the humiliation of being dr essed like a pumpkin at Halloween. Truffles Geraci, however, is unfazed. Yes, she likes wearing costumes (the little ham!). In my latest Whispering Bay romance novel, Then He Kissed Me, my hero Nate gets a dog. Actually, the dog is kind of forced on him by his meddling sister Lanie, but it’s all good. His name is Hector and he’s a mixed Dachshund Chihuahua. Tell me about your dog today over on my Facebook page and you’ll be entered to win an autographed copy of Then He Kissed Me! ← Previous Previous post: Do you remember your first kiss? Next → Next post: Enter That Man of Mine contest!